May is motorcycle awareness month, so we thought it was a good time to review safety tips for both motorcyclists and drivers of regular vehicles too. Since both are responsible for keeping everyone safe, here are eight tips for all drivers. Cars and motorcycles all come equipped with rearview mirrors. While they make driving easier, they don’t give you a complete picture behind and around your car. Motorcycles fit into blind spots easier and make it harder to spot them. Whether you’re driving a motorcycle or driving a vehicle, make sure you are always aware of your surroundings by checking your blind spots and being aware when you’re in someone else’s. Cars are bigger and slower to maneuver. Motorcyclists only tilt slightly to change a lane and can go in and out of traffic easier. This makes it more hazardous for drivers who aren’t paying attention. Wet roads and windy conditions are only a slight annoyance to a vehicle, but potentially hazardous to a motorcyclist. When the weather isn’t sunny and beautiful, everyone should slow down. Motorcyclists must go around puddles and ice, so make sure that you give them room in bad conditions. It is harder for all drivers to see at night, but it is even harder to see motorcycles on the road. Avoid driving a motorcycle in the dark and be watch carefully for motorcyclists when changing lanes in a vehicle. All drivers should signal before changing lanes or turning. To be extra safe, make sure you are signaling for a decent amount of time so it is clear to others what you’re doing. Be aware of what hand signals are used for different turns as well. Road rage is dangerous for all drivers, but it can be fatal for motorcyclists. Don’t tailgate, swerve at, or try to cut off motorcyclists and avoid this behavior is you are the one on the motorcycle too. One bad move could throw the driver off their bike, seriously hurting or killing them. When you approach an intersection, it’s important to be very aware of all the lanes of traffic. Left turns seem to be particularly dangerous for motorcycle drivers because they are hard to see and easy to hit. No matter which way you are turning, look around and make sure you know who is turning and the direction they are moving so that you can all stay safe. Numerous public campaigns have run for decades trying to make everyone aware of how dangerous drunk driving is for society. If you are impaired from any substance, reactions are slowed, behavior is erratic, and decision-making skills are compromised. This makes it harder to drive around a motorcycle with different maneuvers than a normal vehicle. 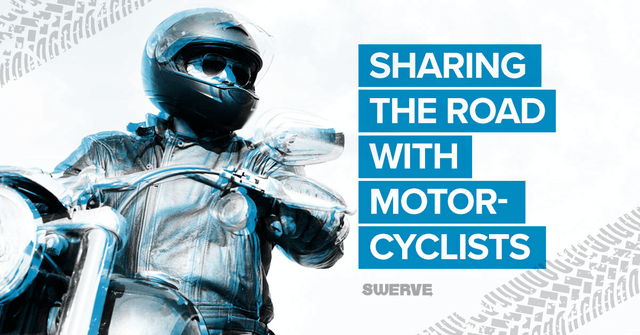 If you are driving a motorcycle, driving while impaired is even more dangerous because one small jerk or swerve can have terrible consequences. Stay safe and stay alert.